Kabardino-Balkarian State University, Nalchik, Russia, 1984. Central Institute of Epidemiology, Moscow, Russia, 1989. The laboratory of Dmitry Gabrilovich focuses on a number of methods that tumors use to suppress the immune system, and on the development of new, effective methods of immune therapy of cancer. Gabrilovich investigates abnormalities in the function of various myeloid cells. These cells play a major role in regulation of immune responses. One group of cells is professional antigen-presenting cells, dendritic cells (DC). These cells are responsible for induction of the anti-tumor immune response. Data generated in his laboratory have demonstrated for the first time that their differentiation and function are severely affected in cancer. Gabrilovich and his team have identified the mechanisms of these abnormalities and proposed several therapeutic strategies to overcome those defects. Some of them are currently being tested in clinical trials. Gabrilovich and his group have found that defects in differentiation of DC are associated with accumulation of immature myeloid cells in tumor-bearing animals and patients with cancer. Under normal conditions, these cells represent an intermediate stage of myeloid cell differentiation. In cancer, however, they lose the ability to differentiate into mature myeloid cells, including granulocytes, DC, and macrophages. They become functionally defective and acquire the ability to suppress immune responses. Gabrilovich together with investigators from other institutions coined the term “myeloid-derived suppressor cells (MDSC)” which is now widely used to characterize these cells. Since 2007, when the term was introduced by Gabrilovich and colleagues, more than 1600 papers studying these cells were published. His lab looks at different aspects of immature myeloid cell biology in cancer. First, they are trying to understand the signaling pathways that are responsible for accumulation and functional defects of immature myeloid cells in cancer. These pathways include NF-kB, Jak-STAT, Notch, Wnt, Rb, and others. Second, they are investigating cellular and molecular mechanisms of T-cell suppression and tolerance induced as a result of abnormal differentiation of myeloid cells and abnormal DC function. The main focus of this group is on the role of reactive oxygen species and peroxynitrite in regulation of T-cell function. His work demonstrates that reactive oxygen species produced by immature myeloid cells in vitro and in tumor-bearing animals in the presence of tumor-derived soluble factors are substantial contributors to the immunosuppression mediated by these cells in cancer. In recent years Dr. Gabrilovich is focused on the role of lipid accumulation in the defective function of DCs and MDSC in cancer. Specifically, his lab is studying the role of oxidized lipids in function of myeloid cells. Most recently his lab became interested in the role of ER stress and mitochondria in regulation of of function of MDSC in cancer. 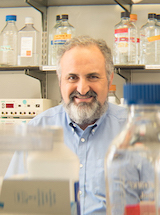 Gabrilovich and his groups also investigate new tumor vaccines. They are exploring several different approaches, including genetically modified DCs. In recent years the focus of the lab on the emerging new paradigm of combining conventional chemotherapy, radiation therapy, and immunotherapy. Dr. Gabrilovich is actively involved in clinical trials testing novel compounds regulating tumor microenvironment.